Rain pelted Scott Bartkowski as he waited on the breakwater. It had been a long day. First, the sun and tide were both out, and the barges sat grounded. By high tide, waves of black clouds dumped downpours on the crew, but they worked anyway. That’s how it played on the first day of the first wave attenuating devices (WADs) in Virginia. 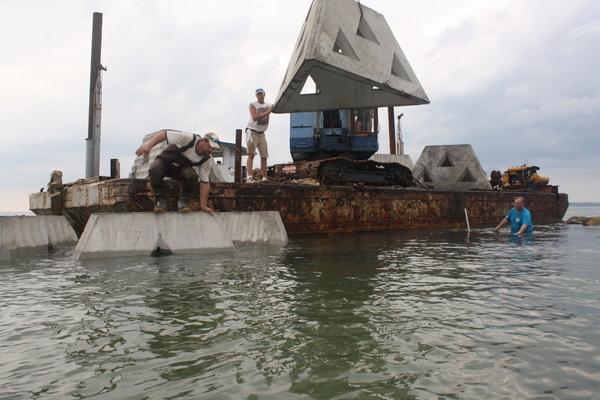 WADS are massive concrete pyramids that sit on the aqueous bottom in rows, breaking the wave action and helping a new beach form at the water’s edge. In Cape Charles, three private landowners have joined to pay for the WAD breakwater to prevent further erosion to their land. It was Sheldon Williams’ job to move the monster WADs into place. Williams, of Cheriton, inched his barge toward the drop site. People waiting in the water watched for lightning, inundated by the sweeping storms. Slowly, slowly, the barge was nudged into position. They tested the crane, then in one swoop — PLOP — the WAD was set in its permanent position. Bartkowski expects it to take 10 days to complete all three breakwaters, which will extend around Seabreeze Apartments to the pilings of the old ferry landing. Are the WADs under water at high tide? If so, will there be markers to alert jet-skiers, canoeists, kayakers, paddle boarders, etc. as to their presence under the water? The WADS are visible during high tide. 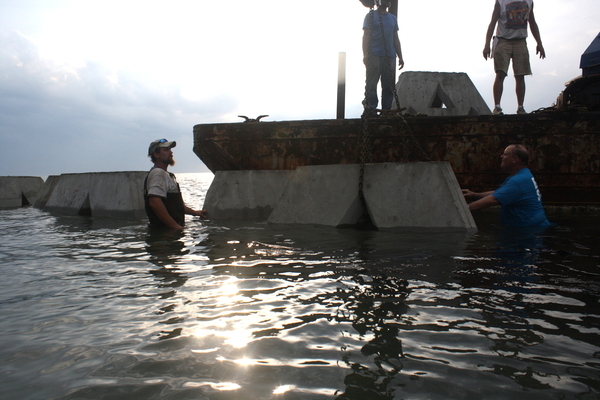 Also 2 Caution Breakwater signs will be erected. One at the North end and the other at the South end of the WAD arrays.The signs will be clearly visible at 6-8′ above the mean high water.